Do you wish to browse the web anonymously? If you do, Search Anonymo might seem like a great extension. 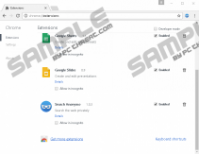 At the moment, it is compatible with Mozilla Firefox and Google Chrome browsers, and users can acquire them from searchanonymo.com. According to the information presented on this site, the add-on can provide you “Advanced Security” by ensuring that your browsing activity is not recorded. If you read all information carefully, you might know that by installing the extension, you also agree to have your default search engine replaced. Unfortunately, most users are very careless when it comes to things like that, and they are likely to just click the “Download Now” button without assessing the situation from all perspectives first. If you are one of those users, you might be shocked to find that your regular search provider was replaced. Is this the reason to remove Search Anonymo from your web browsers? If you feel like it is, you should get rid of the add-on, but our research team has found a more important reason to delete this suspicious add-on. The official sources of the suspicious Search Anonymo include the website that we have already mentioned, as well as the Chrome web store. Unfortunately, third-party installers might be spreading this extension as well. Some installers might be harmless, and they could use the attractive add-on just to introduce potential users to other applications. Of course, the same tactics could be used to promote malicious and dangerous software as well. 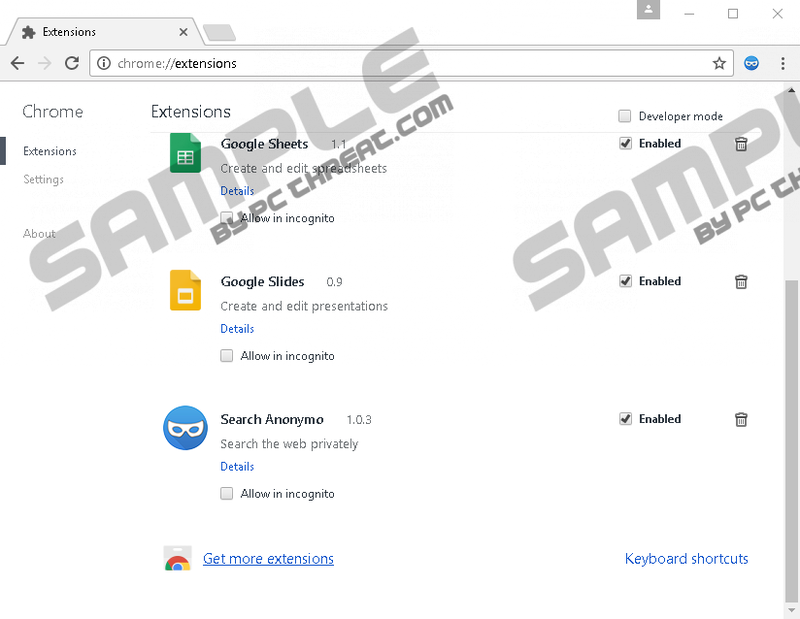 All in all, if you have downloaded the extension packaged with other infections, it is possible that you need to delete other suspicious programs as well. If you are having issues identifying malware, do not hesitate to download a legitimate malware scanner that is capable of discovering even the most recent threats. It is difficult to say what kind of malware or potentially unwanted programs could be found along with Search Anonymo, but you have to be prepared to face dangerous infections. Overall, whether the threats found are considered big or small, we suggesting deleting every single one of them. As you might have discovered yourself, Search Anonymo represents searchanonymo.com as your default search provider. However, instead of redirecting to this page when you enter search keywords into the address bar, you are automatically redirected to search.yhaoo.com, and this is the main reason why we suggest deleting this extension. First of all, the act of redirecting is not as innocent as you might think. After all, you were not informed about which search provider would be used, and you certainly were not informed that you would be redirected to it, which suggests that this activity is unauthorized. Of course, you might pay no attention to this because you are redirected to the popular Yahoo search engine. Do not be mistaken: This is not an error. This search engine has been exploited by Search.tr-cmf.com, Luckysite123.com, Excellentsearch.org, and many other threats that require removal because users are likely to trust it. Unfortunately, the results are likely to be modified to showcase sponsored links, so that the creator of Search Anonymo would earn money. The sponsored content and ads shown to you could be misleading and dangerous, and so we advise ignoring them. You can use the instructions shown below to delete Search Anonymo from your browsers. If you have not scanned your operating system for malware, we suggest doing that as soon as possible. If you discover that your operating system is full of malicious threats that require immediate removal, it might be a good idea to employ a trusted anti-malware tool. In this case, you can trust it to remove Search Anonymo as well. Another pro for using this tool is the protection that it can produce. As long as you have your PC protected, you will not need to face any suspicious, unwanted, or malicious programs. If you have questions for us or you want to discuss the things mentioned in this report, use the comments section to communicate with us. In the Tools menu select Add-ons. Move to the Extensions menu. Quick & tested solution for Search Anonymo removal.